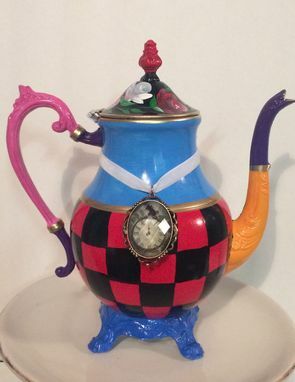 The top half blue for Alice's dress, the bottom red and black checks for the Queen, the legs blue for the Caterpillar, the spout orange, green and purple to represent the Mad Hatter, the handle pink/purple to represent the Cheshire Cat, and a clock charm hanging from a white ribbon, to represent the White Rabbit and she asked for red and white flowers on the top. Can you stand it????? So cool. My job was merely to execute. And it was fun! 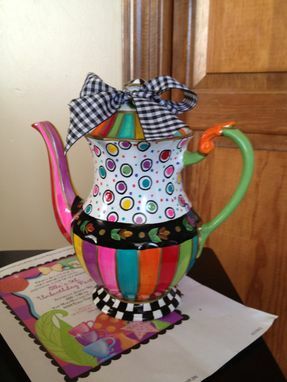 If you have a teapot that you would like me to paint for you, or you would like me to get a pot for you, just convo me. Any colors, any style, any, design.